In EPISODE 2 Jenny Mitchell gives us insider knowledge on planning and costing your coaching website. 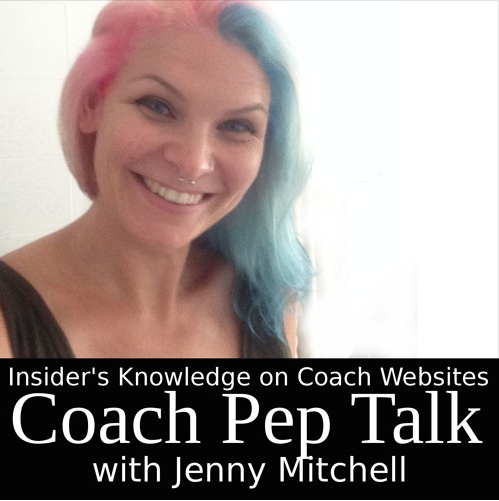 Benay: Welcome back to Coach Pep Talk, the podcast for professional life and business coaches. Pick up new skills ideas and inspiration for your own coaching business with Coach Pep Talk. Benay: This episode is brought to you by our show sponsor Life Coach Office. Go pro and manage your coaching clients online with Life Coach Office the software for managing your coaching business totally online. We had a beautiful testimonial posted on one of our Facebook pages for Life Coach Office last week and I’d loved to share it with you. It’s from an international woman Monique Dahl, who is a psychologist, life, and parenting coach. And this is what she says about Life Coach Office. “Just wanted to share, I’m so happy I found LCO. I signed up for the free trial 10 days ago and was impressed with the simplicity, yet the integrity of the system. As I combine online lessons and one on one coaching in my programs, it is so great and easy to connect both parts in one system. My clients are also very happy as it gives them the tools as well to get the most out of their learning process. Thank you Benay and Kimberly for bringing this system into the world and the perfect customer care.” Thank you Monique. If you’d like to give Life Coach Office a try, please sign up for the seven-day trial and see if it will work for your coaching business too. I hope It does. You can go to lifecoachoffice.com. Oh and I will put that link in our show notes. Benay: I’m super excited to have Jenny Mitchell from Jenny Designs on the show today. Jenny has been my friend for many years but last year she took over the maintenance of my website and I have to tell you it’s been such a relief to have everything on my site maintained to such a high standard. In this episode Jenny shares with us, basically gives us some straight talk about planning your website, costing your website and maintaining it. I know there is a lot of kind of mystery or different price ranges and things out there, but Jenny really is a… gives you a trusted, honest voice on what you can expect when you’re planning your coaching website. Benay: So I’m very excited to welcome Jenny to the show today. Jenny: Hi! Thanks for having me. Benay: Thanks so much for coming on Jenny. So let’s get straight into it. I’ve got so much I want to cover. We’ve got about 20 minutes. So is it okay with you if We just jumped straight into the first question? Benay: Okay. What kind of planning should coaches do before they even consider hiring someone to do their website? Jenny: Okay so there’s three things I think are really important with this. First, you need to have a brand in mind, you need to at least know what niche you’re going to be working in and kind of have some content to go along with that. And then secondly, you need to know your intentions for your website. You need to know what you want to do with, what you want to show the people that come to it. Do you want to build your email list? Do you want to sell your products? Do you want write helpful articles or book coaching sessions, or all of the above? It’s important to know what you want the website to do so that you can go to the website designer with a clear and concise plan. It saves you time and saves you money. Benay: So would you describe those as like goals, like goals for a website? Jenny: Yeah, you could say goals, things that you want to accomplish you know just, what you’re what your main goal is for the website, yeah. Benay: Ok, and just out of curiosity how many goals or intentions should a coach plan on having for the website? Like does it need to do 50 different things or is one goal enough? Or does it matter? Jenny: It does. Well my opinion is that the simpler the better so the more streamlined it is, the more simple it is for the person to use and the more directed it is, you can have 50 products as long as it’s directed in a clear and concise way. But that’s not usually the way it goes. So I would pick two or three of those things and then really concentrate on those. Really find what, what, really what your heart is telling you want to do. You know, because this is going to take your time so it’s important to know exactly what you want it to do. Jenny: And then the third thing is to find… It’s really important that you know kind of in your mind’s eye how you want the website to look and feel. So I always tell all of my clients to get two or three websites that you like, find them, and then write down notes on why you like them and what you like about them so that you can go to the designer and just say this is what, this is a website I like, this is what I like about it so they can kind of you know work off of that and build off of that. Benay: OK, so two or three and sort of borrow ideas and be ready to inform whoever you are working with about the look and the style that you like kind of like. Kind of like If you’re going to decorate your house, you would kind of go with samples and stuff? Benay: Okay. Cool. Can we come back just to point one, which was brand. You talked a little bit about niche and content on your brand, maybe flesh that out a little bit more for people who were listening? Jenny: Well you know if you’re coaching and you have a website and you’ve got you know; you want to have a brand that’s easily discernable. You want to have a brand that’s memorable and you want everything to fit together. You don’t want to have you know your niche be financial coaching and then your product be something about leadership. You want everything to fit together. You want the content to fit your brand you want the content to fit your niche and it’s good to have that up front so that you’re not in the middle of a web site project and all of a sudden you’re like, oh I don’t really actually want to do finance, I want to leadership and then you have to revamp everything. It’s important to know that upfront. Benay: I love to hear you say that, Jenny. So because a lot of times coaches can be… Because we kind of are able to work with lots of different audience types. So what I’m hearing from you is that if you’re going to have a website it really needs to hone in on one specific area. Benay: OK and that really helps. Jenny: It can be it can be a broad subject, like financial coaching is a broad subject. You know, there is a lot of things within that. But you know you don’t want to do like you know, weight loss with finance you know. Benay: Gotcha. It starts to become a little bit unclear. Benay: Okay. Excellent. So we’ve got three parts of planning. So let’s go to the next question. What are the main things that you think a coach has got to have these days on his or her website? Jenny: I think you really need to have a great catch. You need to have you know it can be a freebie, it can be an awesome newsletter. I personally think a great way of catching someone’s interest is to have a great ‘About Me’ section, where the person really gets to know you and gets to know your you know, why you’re doing what you’re doing. That’s just my personal opinion. But I would say the most popular thing right now is to have a freebie, have someone sign up in your opt in, get their e-mail address, and give them a freebie and then from there you can start to up sell them to your products and your services. So I think that’s the most important part of a coach’s website. Yeah. Benay: And then and then followed by a really good about… Is it an About Me page or is this about me information on the homepage? Jenny: Well of course on the home page it’s good to be clear and concise and really get it out there who you are. Which will also come through on your brand too. So if you have a clearly defined brand that will help with that but you know to have a really enticing ‘About Me’ on the home page and then have a feel ‘About Me’ page, you know where you kind of go in to how you got into what you’re doing and why you felt called to do it. I find that to be, that keeps me on the site is getting to know the person. Benay: So really making that personal connection. One thing that I’ve seen it just in the clients that I’ve worked with in the past looking at coaches ‘About Me’ pages sometimes they can be really really long and dramatic stories. Do you have a view on is that good or like what an ideal About Me page should look like, feel like? Should it, should it be short? Jenny: You don’t want to go so long that you know, you lose the reader, but you can break things up on a page in the design process where you know you might have a lot to say, but You can break it up with images and stuff to keep the reader enticed. But I think that ‘About Me’ pages can get kind of off course, I think if you stay on course and you say this is why I choose to do this, this is how I came to this point in my life and what my experience is and say it in a personal way to where the person feels like they’re going to know you. I think that’s the best. So it’s not really a length. Keep the paragraphs short but as far as how many paragraphs you write I don’t think…you Know, you don’t want to write a 10-page book but you know keep it simple, keep it personal, keep it within your brand and your niche too. Benay: Yeah, I really liked that. Like you really want to keep the reader engaged, so if they’re going to fall asleep with you know, the drag on. Yeah it’s a good indicator and you can break it up with pictures and stuff, I think pictures really make a big difference. Benay: Yeah making it real. Okay. Excellent. So let’s sort of take a sideways step now and if you know for the coaches who are listening to the show who are about to get their website done or maybe they’re about to get a makeover, and they’re like really terrified about getting the right people to help them. Because it can be a little bit scary, especially when you don’t have a lot of technical experience yourself, to choose the right person. So how should a coach go about hiring their help? And where should they look? And what do they look for? And What kind of alarm bells should they look out for? Jenny: Well I, there are so many avenues to look. It is overwhelming. So my go to is look for recommendations, when you’re looking at those websites that you like, you know contact them. If you like them a lot, you like the design of the website, you like how it works, contact that person and say ‘who did your web site?’, Or ask the friend. Recommendations I think, personal recommendations are the best and really only way to get a good website designer nowadays, because there’s so many of us. Benay: Yeah, that is so true. Jenny: And you know and you know the thing is that you can go out there and often times when you’re wanting a website, you want something quick, you want it cheaply or less expensive, I hate to say cheap, but you know you do get what you pay for when it comes to websites. So you know, if you go to fiverr.com and you find someone that’s saying you know, I’ll build your website with all these bells and whistles for a hundred dollars. You know, be wary of that. You know, I have worked on and redesigned websites that have come from that you know, kind of process. Benay: I know the one you’re talking about, ha-ha. Jenny: And it is as far as I’ve seen in my experience it never turns out well. Benay: Yeah yeah okay So what I’m hearing then is that an alarm bell is if it’s too fast and too cheap and it’s got too many features, then you should be wary. Benay: No I totally agree with that. Benay: And so to go to look by just getting a referral from somebody that you trust or a website that you like, and then once you actually are in the process of interviewing that designer what specifically should a coach be looking for in that in that person? Jenny: Well, ask for a portfolio. See what they can do. And I guess just personality wise, because this is a relationship. You know, when you’re when I work with a client it’s not about you know just getting something out there, it’s about getting to know the person that I’m making a website for. So you as the client also need to get to know your website designer, you’re going to be talking to them a lot. you’re Going to be working with them a lot. And you need to know that you can get along with them. That you know, if you find their emails grating, it’s not going to be a pleasant experience You know. So I think that the best thing to do is feel them out. See if you like their portfolios. See what they can do. And maybe even contact, most portfolio pages with the website designers and developers they’ll have links to the websites that they’ve made, and you can contact those people and ask for recommendations as well. See what their experience was with them and see if you can work out with them. Benay: So you can you can check their references. Jenny: Right, check their references. Which sounds like a lot of work. A lot of it’s just intuition You know, Unfortunately, when you’re hiring someone, and that’s when it comes to recommendations too. It all comes down to recommendations you know, oh my friend used this person and their friend used this person you know, and they have a good standing. Benay: Okay, oh that’s great, really good insights there. Thank you. Okay so I know this is the question that every coach wants to know if they haven’t stepped into this space yet, but how much should a coach expect to pay for a decent website? Jenny: Okay. So this is really tough to answer actually. There’s so many different things that can change the price on a project. As it stands now the average website costs, the project price is usually between let’s say 2000 dollars and up, depending on what you want. Benay: Is that U.S. dollars? Jenny: That’s U.S. dollars and that’s, that’s on the low end. But you know it depends on what you want. Like for a life coach website say you want a home page, you want about page, you want a contact me, and a services page. That’s four pages, maybe five or six. You know you could get away with probably around 1500, but most often you’re not going to be able to find a website designer to go less than that $1500 US. So come in prepared you know, to budget for that much. You might find some higher on the spectrum and lower, but between $1500 and I would say about $3000 for a Life Coach website. Benay: So if someone comes in for about $800 or something, that should set my alarm bells off then? Jenny: Well it depends on again how many pages you have. I’ve done web sites for that price, but it was a three-page website where it was literally like nothing on it except a home page, an about page, and a contact page. So it is very project oriented like it’s very subjective. And there’s a lot of people I’m sure who would listen to this and say, ah she is charging too little, or ah, she is charging too much. You know this is what I usually charge and I know a lot of people would disagree because it is personal You know. Benay: No, it seems pretty consistent with what I found in the marketplace. I think those are pretty fair. I mean that website we were referring to before, I think that came out, like it was proper big website and they quoted about $800 for it, with all the bells and whistles and the e-mail lists and everything, and so that’s I think that’s an alarm bell. Benay: You can’t get an all singing all dancing super fancy website for that price unless it’s some genius kid student who… And even the communication channels and project management skills might not be worth it. You get what you pay for. Benay: OK, so just before we leave the cost thing. This sort of 1500 to 2000-dollar website, does that have an e-mail opt in list? Does it have any other bells and whistles? Jenny: It would have…Yes you would have an opt in. It usually includes a premium theme and the plugins and all that, all that’s worked into the price. And it would have an opt in, it would have a contact page, it would have about page, you know some pop ins if necessary. Not you know, adding like a membership site or adding a booking page or something like that would raise the price. So that’s just very basic like here’s my freebie, here’s my products, maybe have some PayPal buttons on there. Nothing too involved would be in the lower price end. Benay: Okay now that’s great clarification. Thank you. OK. So we do need to wrap up but I really do want to touch on this on, because I know from personal experience and from a lot of coaches that I’ve just known and worked with, that ongoing maintenance for a site is often overlooked. Coaches will go in and they’ll budget for the all singing all dancing site to be created, but there are actually some ongoing costs and maintenance activities that need to happen to keep everything healthy and ticking over properly. Can you talk a little bit about that and maybe help coaches get their head around what to expect once their site is actually live? Jenny: Of course. So with ongoing maintenance, the basics are: is making sure that your website is backed up, making sure that all of the plugins and themes and WordPress itself is updated, and also keeping an eye on the security of the website, and keeping an eye on things like broken links that can hurt your SEO scores and turn people off your site. And also, oh I just lost my train of thought, ha-ha. Benay: So it’s backed up, plugins are updated, security is regularly checked, the broken links are fixed for search engine optimization. Jenny: Right and just having a person watch over it all the time. If your site crashes for some reason, which does happen, it’s the professional looking at it it’d be like okay I can fix that right away and I know it’s down, it’s adding the content but you need. A lot of times the websites nowadays, it’s not as easy as just going in and editing some text here and there You know, sometimes they’re more complicated and you need to have someone actually go in and put your blog post in for you. Things like that. So maintenance it is really important just for the security of the Website. If you don’t update everything, hackers look for that so quickly, and if your website’s hacked, then Google finds out, and your clients find out, and it’s really bad. Benay: You get blue hair and warts all over your face. Jenny: Yes, ha-ha, you’re ostracized from the website community. But I mean that’s important to know that that’s there and that your sites secure and everything. Also if you don’t update those and don’t keep an eye on that, things can start to break any website, it starts to look unprofessional it starts to look old. And that’s a good sign of you know, if someone’s looking for someone to be their life coach they want to see a dynamic, awesome, responsive website. So having things broken on it or, not showing up, or images that aren’t there, you know a slow site will turn people away from your website. So it’s important to maintain it and it’s you know it’s something that can be done yourself, if you have some background in it, but if you don’t it can be really confusing and many times I’ve seen people where all of a sudden their site’s gone, and they don’t know what to do and they end up calling me. So it is good to just hire a professional, have them maintain the site for you. You don’t have to worry about it. You can email them with any questions. It’s just it’s peace of mind. Peace of mind that your website is going to continue working. Benay: And what Should a coach expect to pay for that maintenance package I suppose? Jenny: Well it varies. The very basic plans usually are between 50 to 100 dollars, for my plan it’s sixty dollars a month. And then it goes up from there. There’s I mean there’s different kinds of plans, all under the sun, but mine go up you know as the next plan, I add hours, so then you can contact me and say, oh I need this fixed on my website and that you know, is free within your maintenance. So each plan just goes up and has more hours but the basic ones are around 60. I think the most expensive one I have is around $150.00 a month. Benay: So a basic maintenance plan would include backups, and plug in updates, and regular security checks, and just start awareness that if the site is always up and always live and a regular broken link check for a search engine optimizing. Is that right? Jenny: Right. Yes, and often times when you do update plugins and things, some things on the site can kind of go wonky. And so you’ve got to really know how to fix them, so that’s where to having… Because paying someone an hourly rate can add up really quickly. So if you have them on a maintenance plan it’s just easier because then, when I update a plug on a site and it makes images disappear I fix that. That’s within the maintenance plan.’. Benay: Got It. Okay. Okay that’s great. I’m hoping for our listeners that this whole maintenance area is something, if you are already aware of it Fabulous, but if you aren’t that now you can start to budget for it and make sure that that kind of work is being done. Because I know that before I met Jenny I was a little bit lax with that kind of stuff but now everything is just tip top shape and it just feels really good. Gives me, like you said Jenny, peace of mind. Okay we’ve got to wrap up. We went all over but we’ve…. I think, Jenny, you gave us so much fabulous information for anybody out there listening who’s about to start their website. Now I know before we go that you have a website planning checklist that you offer as your freebie on your site. If someone wants to get a hold of that to start just planning their own website and do some of that early thinking in those three steps where can they get that? Jenny: Okay, it’s actually on my website, its jenny-designs.com. And it’s right there on the home page. Just sign up for my newsletter and you’ll get the freebie in your email. Benay: Excellent. Okay, so just sign up for the newsletter. Okay well thank you so much for being on the show today and sharing all of this fabulous information with coaches all over the world. Jenny: Thank you so much for having me. Benay: Alright, I am sure we’ll catch you soon. Bye.